Activity:The active ingredient capaiscin is used as a pain killer. It is a nerve stimulant which is able to overwhelm pain sensors. Plants and herbs have been used around the world for millennia to alter brain function—think about how people drink coffee or tea to wake up in the morning. This happens because the chemicals in the plants are similar to chemicals that our body uses and can affect the body’s interactions with those chemicals. Does your family cook with red pepper (cayenne pepper) or do you enjoy sprinkling red pepper flakes on your pizza? The hot and spicy taste in cayenne pepper comes from a chemical called capsaicin. Capsaicin is found in all chili peppers and it is a human irritant—it causes a burning sensation. Some people enjoy this burning sensation in the mouth. 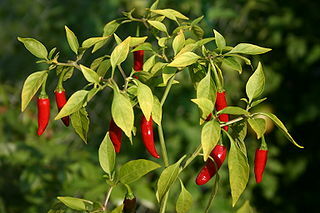 In fact, chili peppers have been used for at least 9,000 years by Native Americans as both food and medicine. Although capsaicin is an irritant that causes a burning sensation, interestingly, over time it appears to reduce pain. Capsaicin is currently used as an ingredient in skin ointments and creams to relieve pain, such as that associated with arthritis and shingles. Scientists are also researching capsaicin as a key ingredient for an experimental drug injected by a doctor which may relieve arthritis pain for weeks to months after injection. The pain relief caused by capsaicin seems to be connected to the burning sensation. When neurons in the body are exposed to capsaicin, they release substance P, a neurotransmitter that sends information about pain and heat. If the capsaicin remains on the body for an extended period of time, the body runs low on substance P and can’t continue to respond. The body is unable to send a pain message! In other words, when you leave capsaicin on the skin, the neurons are depleted of the neurotransmitter substance P and this reduces pain sensations. Current research also suggests that capsaicin is able to kill cancer cells—this is another amazing chemical derived from a plant!